When I first reported that Silverdale Water District was preparing to install a system of purple pipe for water reuse, it seemed the district was far ahead of everyone else in Kitsap County. Recall my story in the Kitsap Sun March 31, 2008, and the Water Ways entry that followed on April 2. 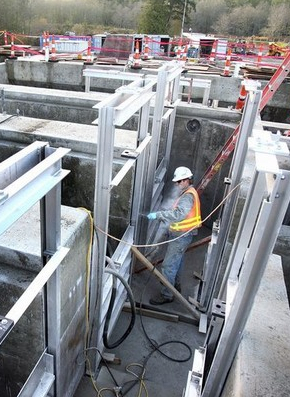 A new headworks at the Central Kitsap Wastewater Treatment Plant is part of major sewer upgrade designed to reuse the efflent. Kitsap County commissioners started talking to Silverdale Water District commissioners a couple months later. See Kitsap Sun from June 2, 2008, and Water Ways from June 3. Now the county commissioners are about to approve a six-year plan to design and install equipment capable of producing 3.5 million gallons of highly treated effluent every day, as I reported in Sunday’s Sun. That’s a lot of water, enough to irrigate ballfields throughout Silverdale with water to spare. Now the ball is in the court of Silverdale Water District. District manager Morgan Johnson told me today that if the district can be assured of getting treated effluent from the Central Kitsap Wastewater Treatment Plant, it will move forward on building a backbone of purple pipe right into the heart of Silverdale. If the county commissioners on Monday approve the six-year sewer plan and move ahead with a $41 million bond issue, it will be time for county officials to begin negotiations with those from Silverdale Water District. Tying up all loose ends about how much water will be provided as well as who will pay for what will be necessary to create one of the largest water-reuse systems in the Puget Sound region. Morgan Johnson told me that he was surprised at how quickly the county commissioners embraced the notion of reusing treated wastewater, starting with that meeting more than two years ago. The county commissioners keep saying they are quite serious about their year-old “Water as a Resource” policy. Every county department must report annually about how they are advancing the effort to save and reuse as much water as possible. In a sidebar to my main story Sunday, commissioners Steve Bauer and Charlotte Garrido talked about how this policy can protect the water resource while saving the county money. Stella Vakarcs of the Kitsap County Wastewater Utility said she would like to hold a “water summit” that would bring water and wastewater officials together to discuss the future of the effluent. In addition to the CK plant, county officials are considering uses for treated effluent from the county’s plant in Kingston. Meanwhile, officials with West Sound Utility District, which already produces high-quality effluent near Port Orchard, are getting ready to use that water for irrigation. It will take about a year to design the upgrades at the CK plant. Construction is planned to begin in the summer of 2012, and the system should be completed about 2016. If things go well, the purple pipes could be in the ground by then and ready to be charged with reused water.